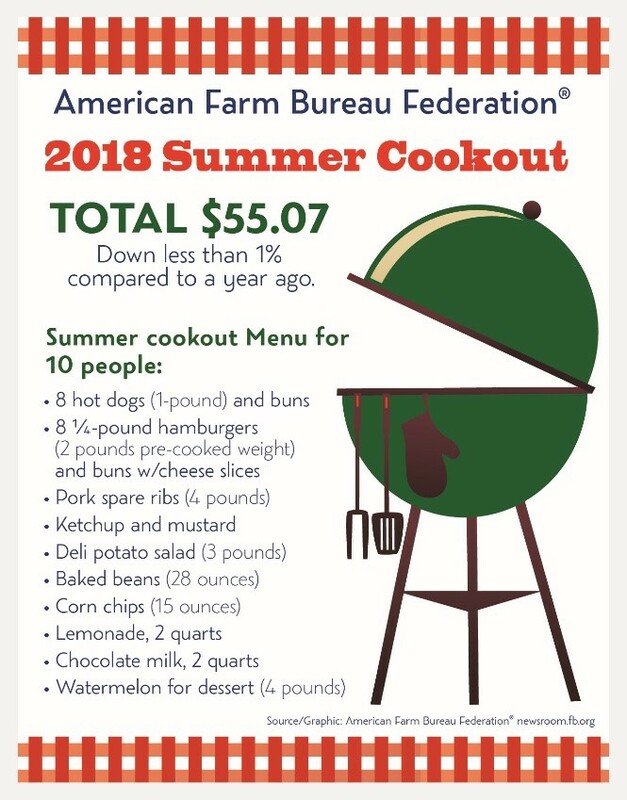 WASHINGTON, D.C., June 25, 2018 – A cookout of Americans’ favorite foods for the Fourth of July, including hot dogs, cheeseburgers, pork spare ribs, potato salad, baked beans, lemonade and chocolate milk, will cost slightly less this year, coming in at less than $6 per person, says the American Farm Bureau Federation. The year-to-year direction of the marketbasket survey tracks closely with the federal government’s Consumer Price Index report [bls.gov] for food at home as both the index and the marketbasket remained relatively flat compared to year-ago levels. AFBF is the nation’s largest general farm organization with member families in all 50 states and Puerto Rico. Learn more at http://facebook.com/AmericanFarmBureau [facebook.com] or follow @FarmBureau [twitter.com] on Twitter.